Godolphin filly Athiri has had a spin around Caulfield to prepare for her first start at the track. Exciting Godolphin-owned filly Athiri has made an instant impression on James Cummings’ Melbourne-based assistant trainer in preparation for her Blue Diamond Stakes bid. Athiri arrived at Godolphin’s Flemington stables in Melbourne from the operation’s Sydney base a few days ago ahead of Saturday’s Group Two Blue Diamond Prelude (1100m) for fillies at Caulfield. 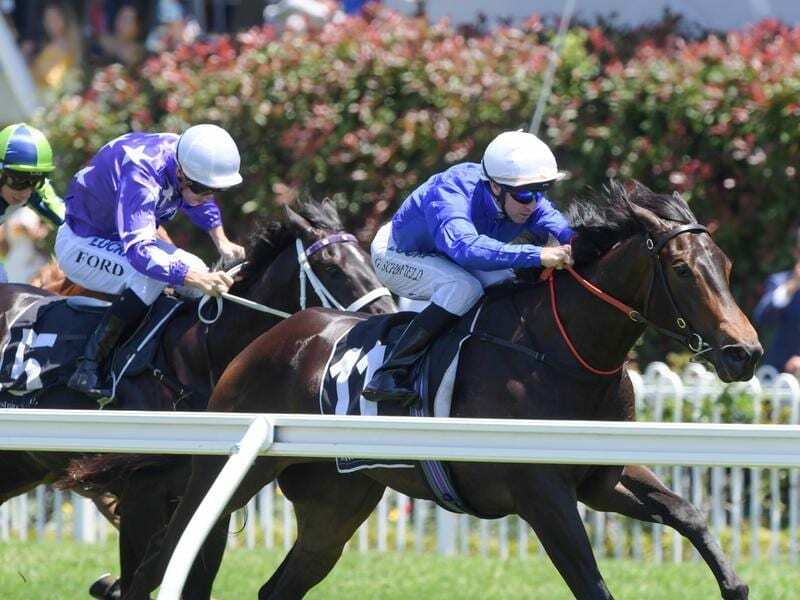 The two-year-old, who was impressive winning on debut at Rosehill on December 1, is high up in Blue Diamond Stakes betting and was taken to Caulfield on Tuesday morning to familiarise herself with the course in a gallop in company with stablemate La Tene. Kate Grimwade, Cummings’ Melbourne assistant, oversaw the work and said Athiri made a “very good impression” at what was the first time she had seen the filly gallop in the flesh. Grimwade said Athiri had a good look around but she appeared to complete her work effortlessly alongside her work partner. “I can see what all the fuss is about now,” Grimwade said. “It’s nice having horses like that in the yard. “I thought it was a particularly impressive bit of work. “Her work companion has raced twice and been placed twice so she’s no slouch and Athiri just looked to me like she came up through her gears in really impressive fashion. Dwayne Dunn rode Athiri on Tuesday but James McDonald has the ride in the Prelude on Saturday, two weeks before the Blue Diamond. “I think actually her best work was probably after the line,” Grimwade said. “And Dwayne commented on that too. Grimwade expects that experience to prove valuable for Athiri on Saturday when she is set to clash with two of the Blue Diamond favourites, Catch Me and Brooklyn Hustle. “She’s quite a laid-back filly anyway but it does them the world of good to see where they’re coming (to race),” Grimwade said. The Cummings-trained two-year-old colts Microphone and Auxin worked together as did Avilius, who resumes in the T S Carlyon Stakes, and Aramayo, who runs in the Autumn Stakes. Kementari and Best Of Days are expected to arrive in Melbourne later this week for Saturday’s Group One C F Orr Stakes.